February is the last true month of winter. Spring is starting to appear with tulips, hyacinths and primrose featured in garden centers and grocers and soon those snowdrops and hyacainths will begin to emerge . Enjoy skiing, sledding, skating and all that frosty beauty before it melts away. Discover how to collect and preserve flowers, leaves, grasses and other natural Ingedients for use in creating your own floral masterpieces. Learn the best flowers to grow and how to press for optimal color, durability and longevity. Participants will make beautiful bookmarks, cards, a dipped candle and floral votive container to take home. All materials and handouts are included. Easy and fun! Loveland Fire and Ice Festival, February 9-11, More than 100 carved ice sculptures, fireworks, food and entertainment. www.lovelandfireandice.com . Denver Restaurant Week, coinciding with the home show, February 23 to March 4. Hundreds of Denver’s top restaurants offer multi-course dinners for three tasty prices $25, $35, or $45. Check out that posh restaurant you’ve been wanting to try. Make reservations early, the 6-8PM spots fill fast. Clyfford Still Museum, free Friday evenings in February from 5-8pm. Give those trees, shrubs, perennials and bulbs a drink on warm winter days, especially if it’s been dry, windy and warm. Yes it’s barren outside but change is underfoot. Look over your garden books, magazines and seed catalogs and design your perfect garden. Will you have edible flowers? Savory herbs? Designer vegetables in container gardens? It’s easy to get carried away so you need so do some planning. Take out a piece of paper, make a rough sketch of your garden and then fill it in with your selections. Check out the local nurseries for open houses or just a shot of spring on a cold winters day. Pick up some blooming tulips or fragrant hyacinths or an easy care cyclamen or kalanchoe. Take some classes. Garden Centers are gearing up and many offer free classes on everything from growing seeds indoors to what fruit trees to plant. 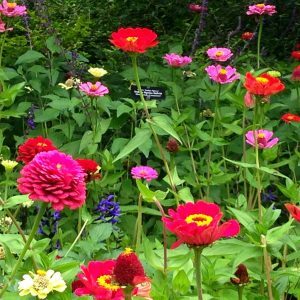 Check O’Tooles, Echtors, Tagawa Gardens and other nurseries for special events, classes and deals. Denver Botanic Gardens has great classes year round. Saturday, February 17 is their annual New Gardener Boot Camp, a full day of classes to get you ready for the season. A great resource for free, expert advice is your local county extension office. Master Gardeners and horticulturists are on staff to answer questions and dispense with helpful handouts. February 1st is Imbolc, an ancient pagan holiday celebrating Brigid, the Celtic Goddess of fire. She provides the fire of inspiration, healing, poetry and divination. Light a candle during this time of growing light and dedicate some time to find out what inspires you. What lights your fire? This is a time to celebrate new beginnings and to plant seeds for the future. All of you sushi lovers are well acquainted with this elegant sea vegetable. Seaweed is actually not a plant or animal, but a form of algae. A wide variety is readily available in the Asian markets or the ethnic food isle. A true super food, seaweed is an excellent source of calcium, iodine, folic acid and magnesium, and a host of other nutrients. It is high in ligans, plant compounds that protect against cancer and help relieve menopausal symptoms, and fucans, which can reduce inflammation. If you have stress and anxiety issues, try seaweed for the B vitamins pantothenic acid and riboflavin, often depleted with daily tension. Dried sea veggies can be cooked in soups, stews, casseroles, stir fry’s or whatever inspires you. Some can rehydrate to four to five times their original size. I put them whole in a soup or chowder and remove the expanded portion before serving. The broth will absorb the good stuff and no one will reproach you with “What is this slimy stuff?” Seaweed is also great for cooking beans. Try 3-6 inches of dried kombu in your next pot, it will help speed up the cooking time, add nutrients and improve digestibility. 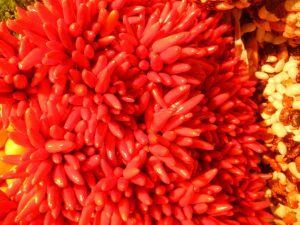 Sea weed is also wonderfully nourishing for the skin and hair. You’ll find it in every form of beauty product from soap to creams to toothpaste. A seaweed soak will relax and soften feet and hands. I have used a seaweed soak many times to treat my overworked transporters, they positively throb with happiness. Seaweed comes in a lot of varieties. Nori are the dark sheets used for sushi, kombu comes in strips and is great for seasoning beans and soups, arame is black and wiry and probably my favorite as it has a mild taste. Other varieties include kelp, wakame, hijiki, and dulse. All are somewhat salty. Try a few and see what appeals to you. If you are on thyroid medication and are on a low iodine diet, check with your doctor for recommended levels of seaweed consumption. Seasoning Blend – Grind equal parts dried seaweed and toasted sesame seeds in a food processor and use as a salt replacement on everything. Arame is my favorite for this. Soups and Stews – Throw in 1/8 to 1/4 cup of seaweed to your soup, leave whole and remove it before serving, or crush it while you are adding it and leave it in. Remember to cut down on the salt in your recipe. Stir Fry’s – Add some chopped, pre-soaked seaweed to your next stir fry. Seaweed Soak – Get a good amount of seaweed, this is great project for a seaside vacation, and put in a container large enough to soak your feet. Add hot water and submerge those aching dogs. You could also soak seaweed in a large pot, then strain and put in your bath. Very soothing and softening. Garden – Makes a great fertilizer. Get a kiss from Mother Ocean and incorporate this amazing plant into your life. A classic Spanish tapa, shrimp with garlic is delicious and a snap to make. Don’t overcook the shrimp; they will go from tender and succulent to hard and rubbery. 6-8 medium garlic cloves sliced thin or better yet, whole cloves of roasted garlic. You can find these pre-cooked at deli olive bars. Melt butter with oil in skillet over low heat. Add raw garlic if using and sauté until golden. If you are using the pre cooked garlic and the shrimp and garlic together and stir, cooking over medium heat until opaque, about 3 -4 minutes. Top with chives and parsley. Serve warm with baguette bread. Melt butter and oil in saucepan. Add onions, coating onions with butter mixture. Add a dash of salt and continue to cook onions over medium low heat, stirring occasionally, for 15-20 minutes until they are golden blond. Add the garlic and cook for another 3-4 minutes. Add broth and Worchester and bring to a boil, reduce heat to simmer. Option 1: Ladle the hot soup into 4 ovenproof bowls, put the bread on top and cover with the cheese. Place under broiler until cheese is melted. Option 2: Cover the toasted bread with cheese and place in the toaster oven or regular oven at 400, until melted. 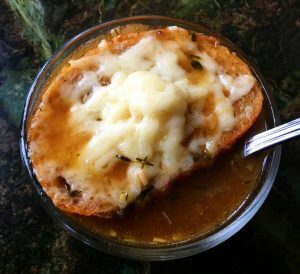 Put the hot soup in soup bowls, top with the bread and serve. *For vegetarians, you can substitute with veggie broth. Preheat oven to 350. Combine dry ingredients in bowl. Add eggs, milk, oil, and vanilla extracts. Beat on medium speed for 2 minutes. Stir in boiling water, (batter will be thin), Pour batter into muffin pan, no more than half full. Bake for 15-20 minutes, until a toothpick inserted in center comes out clean. When cool enough to handle, cool completely on wire racks and frost. In a large bowl, beat butter until creamy. Beat in the confectioners’ sugar, vanilla, and enough milk to achieve desired spreading consistency. * For extra pizazz add chili powder to the frosting also. Posted in 2018, The Herb Blurb and tagged classes, clinical herbalist, Denver Botanic Gardens, Denver Botanic Gardens classes, fun things to do in colorado, gardening, Herbalist in Colorado, Pressed Flower Arts, recipes, retreat, seaweed, Spring Self Renewal.